For me massage is a non-verbal way of communicating and it provides important physical contact to convey warmth, reassurance and calmness to the body. It is a sequence of hand movements and pressures over the muscular structure of the body. Our initial meeting will begin with a full consultation (at no extra cost). The benefits of receiving a massage include:- loosening of tight muscles and relief from muscular tension. It stimulates blood circulation bringing fresh blood supply and oxygen to muscles, relieving any aches and pains. Overall a massage balances, relaxes and provides a sense of well-being. The massages will be conducted on a comfortable massage couch, or chair for Indian Head, with soothing music and soft lighting. Massage offers a cumulative relaxing effect and in my experience, it can take up to three sessions to fully appreciate the benefits. I accept female clients for massage sessions and male clients only on a referral basis from some one I already know. Some medical conditions contra-indicate massage as it may adversely affect you, on occasion I will request a Doctors approval before commencing a massage. 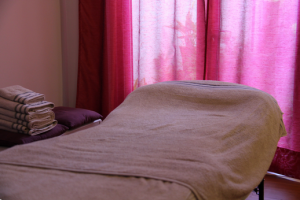 The following massage treatments are available from the studio at my in Newport. Aromatherapy Massage – A relaxing or stimulating massage, designed to increase blood through to the surface of the skin and the muscles beneath. Using a blend of oils specifically chosen to suit your requirements and how you are on the day. Indian Head Massage – you will remain seated, it is a dry massage (no oils) of the shoulders, upper arms, neck, scalp and face. This is a deeply relaxing massage. Indian Head Massage – 35 minutes. Additional Training – I have recently undertaken several advanced massage courses, which have given me specific techniques to help with lower back, neck and shoulder tightness/discomfort.